Windows 10 clean boot is used to diagnose Windows errors with a minimal set of startup programs, software or drivers. You could use Windows 10 clean boot to determine which driver or program causes the problems and then troubleshoot them. It is reported that most of the Windows user encounter various Windows 10 issues like internal power error, WiFi not working, endless reboot, etc. after the Windows 10 upgrade or the Windows 10 anniversary update. And today I will introduce to you how to use Windows 10 clean boot to check for PC errors. Use Windows shortcut keys Win + R or right click the Start menu to open the Run dialog. 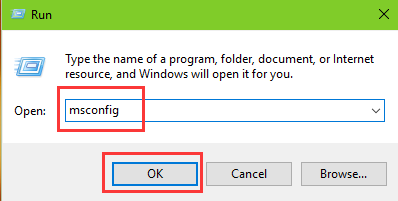 Type msconfig into the box and press Enter key or click OK.
Click General tab on the System Configuration box. Choose Selective Startup and uncheck the Load startup items check box. Click Services tab. 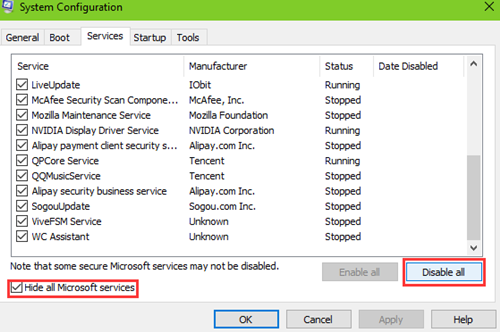 Check the Hide all Microsoft services and then click Disable all. Click OK and then click Restart on the new pop-up dialog box. This step will help to diagnose whether there exist errors in the services after the Windows 10 clean boot. Repeat the process 1 and process 2 in the Step 1. Click Services tab and check the Hide all Microsoft services. Enable the first half of the services and disable the rest. If you have identified no problematic services in the first half items, try another half of the services with the same steps. If the errors still annoy you after all the services check, go on reading Step 3 below. If you did find out the problematic service, go and read Step 4. 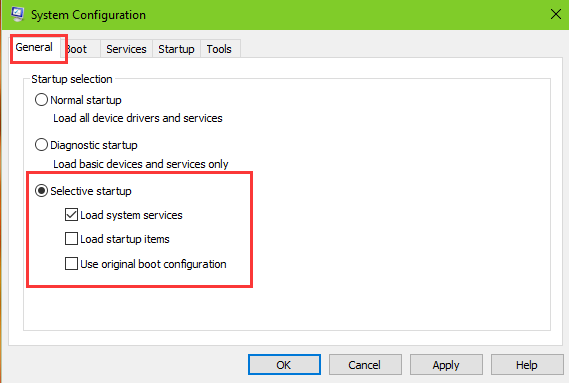 This step is similar to Step 2 and it helps to diagnose whether there exist errors in the startups after the Windows 10 clean boot. Repeat Step 1 to perform a Windows 10 clean boot. 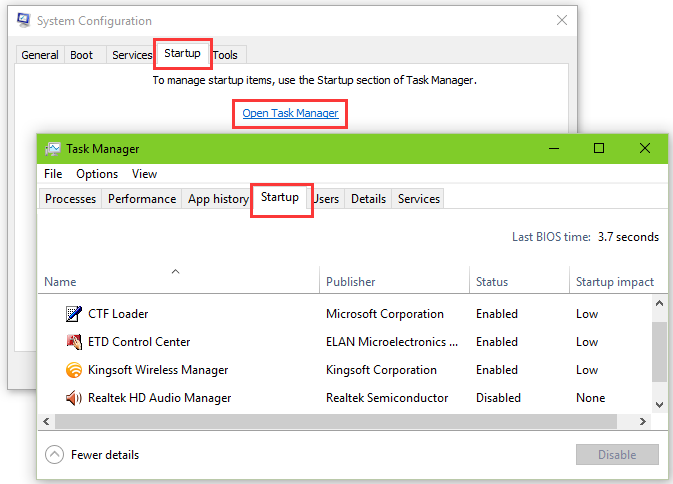 Choose Startup tab and click Open Task Manager. Enable the first half of the startups and disable the rest. Click OK and Restart the PC. If you’ve identified no problematic startups in the first half items, try another half of the startups with the same steps. If the errors still occur after all the startups check, you’d better repeat Step 2 and uncheck Hide all Microsoft services to figure out the exact problematic service. If you did find out the exact problematic service or startup after the Windows 10 clean boot, you could keep it disable so that the errors can be solved. Or you could do a search for solutions. Open the System Configuration box. Click General tab and choose Normal startup. Follow the instruction on the screen and restart your computer. Note: The PC may lose some functionality temporarily after the Windows 10 clean boot and the functionality will return when you perform a normal PC start. Clean boot is one of the best methods to detect what exactly is the cause of the PC errors. For example, many Windows users complain about the Windows 10 airplane mode on or off errors after the Windows 10 upgrade. It is easy for them to perform a Windows 10 clean boot and figure out the black sheep from the list to resolve the problem. If the clean boot could help you fix the errors, share this with your friends. Any knowledge of Windows 10 clean boot is welcome. I want to show my thanks to the writer just for bailing me out of such a incident. As a result of looking out through the world-wide-web and coming across recommendations that were not powerful, I believed my life was done. Living without the approaches to the difficulties you’ve resolved all through the guide is a crucial case, as well as those which may have negatively affected my career if I had not discovered your web page. I’m not sure what I would’ve done if I hadn’t come upon such a point like this. I’m able to at this time look forward to my future. Thank you very much for the high quality and result oriented help. I will not hesitate to recommend your blog post to anybody who should get counselling about this subject. Windows just had an update that seemed to disable my wifi. Without wifi I can’t work remotely. Also I can’t reset my PC to factory default. I’m unsure if there’s a reset button. It seems that the update disabled a couple of important drivers, too. Hi Nisha. You can go to the Settings > Update & security > Recovery to reset the PC. Mine just do the endless update and I couldn’t click or restart my pc. After 3 days of sleepless nights and despair I just gave up, turn off my internet and go to sleep. I restart my pc without any internet because of my desperate thought that “without internet my windows may not update” and voila my windows just ignored all updates and went back to normal. I don’t know it was a fluke, a miracle or it was a real solution (no internet). Thank you for your informative comment! Have a nice day! My laptop is giving blue screen and the error code is somthing with vedeo ….. My grhapiks drivers IS up to date please help. Can it be my usb nee headphones? Seriously! This article is a life saver! I cannot thank the writer enough! God bless you and all your endeavours!